Spend £60 for FREE Mankind gift. Discount has been applied to RRP. Offer valid for a limited time only. Achieve fuller, thicker looking tresses with the Cerafill Retaliate Hair Thinning Conditioner from Redken. Harnessing the powers of Menthol, Ceramides and SP-94, the lightweight cream-gel delivers a pleasant cooling and tingling sensation; it helps to strengthen the hair fibre, whilst nourishing the scalp to create a healthy environment for hair growth. Suitable for men and women with advanced signs of thinning, hair is left feeling dense and voluminous with added shine and an invigorating Ginger and Mint fragrance. 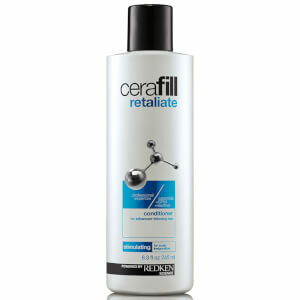 After shampooing with Cerafill Retaliate Shampoo, apply and distribute from scalp through ends. Leave on 1-3 minutes. Rinse thoroughly. Aqua/Water/Eau, Hydroxypropyl Starch Phosphate, Glycerin, Quaternium-87, Parfum/Fragrance, Propylene Glycol, Phenoxyethanol, Candelilla Cera/Candelilla Wax/Cre De Candelilla, Menthol, Stearyl Alcohol, 2-Oleamido-1, 3-Octadecanediol, Benzyl Alcohol, Limonene, Linalool, Chlorhexidine Digluconate, Geraniol, Safflower Glucoside (D164335/2).